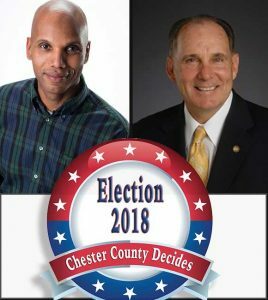 PA HOUSE DISTRICT 160 – With less than a month until Election Day, the race in the 160th district is shaping up to be a battle for the ages: The Son of Darby vs. The Kid from Kennett. The veteran vs. the rookie. Goliath vs. David. Incumbent Stephen Barrar (R), who became the representative for the Pennsylvania House of Representatives’ 160th District in 1996, is facing off against newcomer Anton Andrew (D), an attorney and non-profit founder who resides in Kennett Square. What motivated you to run in this race? How would you describe your opponent? What is the most important issue to you in the race for this seat? If you could change one thing about how the Pennsylvania state government is run, what would it be? Barrar also noted that limiting terms to eight years could help avoid the type of corruption that has happened among both Republicans and Democrats. “I think if you’re doing a good job, people will vote to keep you in office,” he said, noting that voters are much more aware what their elected officials are doing because of social media. Andrew: “I would change making it easier for people to access the record of their elected official. Making it more accessible so that you don’t have to search for it, that it’s there for you. Greater transparency and making people aware of the positions that their leaders take.” Andrew cited the recent fair district legislation and the last-minute changes made to it, which Barrar supported, as an example of non-transparency in the House of Representatives. What is your position on the legalization of marijuana for recreational use in Pennsylvania? Do you have any comment on the confirmation hearing for Brett Kavanaugh’s U.S. Supreme Court nomination, or the related FBI investigation?